This was uttered by Michael Avenatti on the Lawrence O’Donnell MSNBC show when he was asked whether there will be any further disclosures regarding Michael Cohen. It is a mashup of “show (one’s) cards” (to make one’s plans or intentions known) and “empty (something) out” (to remove or pour all of the contents from something). Revealing and then emptying seems to be what he has done to date, so the malaphor makes sense. 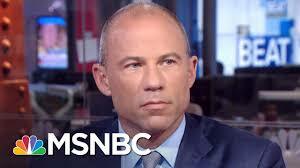 This is not the first malaphor uttered by Michael Avenatti. Check out some of his other great mashups, like “he folded like a cheap deck of cards”. A big thanks to Beatrice Zablocki for hearing this one. She’s a major contributor to this site. She’s the top of the notch! A big thanks to Frank King who spotted another one. He is quickly becoming the Frank King of Malaphors.